If you’re not familiar with it, it’s about a family of orphaned children who find an abandoned boxcar and adopt it as their home. It was, like, the ultimate in playing house. I relished all the little details–dumpster diving for silverware and then scrubbing the rust off with sand. Building a “swimming pool” in the creek by the boxcar. Making a stew in the woods with beef and some garden vegetables. Looking back, when I read this book, it was the first time I was completely captivated by the story of food and cooking. I had never really eaten stew before (at least not stew that didn’t come from a can), but I was completely taken with this idea of something wholesome and delicious cooked with something practical like baby garden vegetables and some meat bought after a hard day’s work. Fast forward a few years–after my mom died and my dad remarried, we did eat a lot of beef stew. In fact, this recipe was our standard Sunday dinner. Everything would go into the Dutch oven and then into the oven before we went to church and when we got home 3 hours later, it would be ready. When we had it with whole wheat bread and butter and milk to drink, it seriously fulfilled my Boxcar Children vision of delicious wholesomeness. 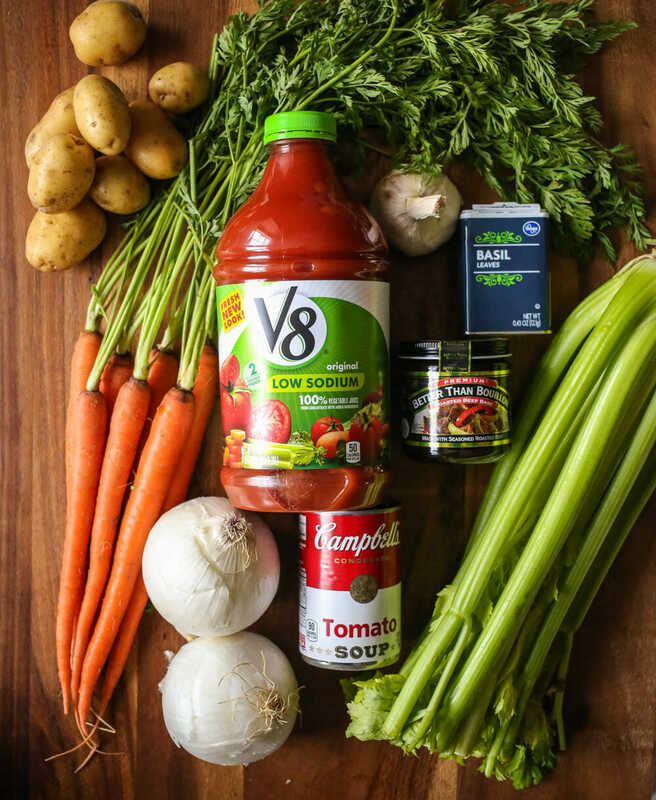 I’ve changed the old standard a little–added some (a lot of) garlic, substituted V8 for tomato juice and beef bouillon instead of just salt. But really, it’s all the same: something easy, nourishing, and delicious that just about everybody loves. You’ll need some carrots, celery, an onion, baby potatoes, beef bouillon/base, V8 (or other vegetable cocktail like Bloody Mary mix), fresh garlic, a can of tomato soup, dried basil, and freshly ground black pepper. You’ll also need some lean stew meat. You may need to cut some of the pieces into something a little more bite-sized. Preheat oven to 300 F. Cut the veggies–I usually make the potatoes on the large side of bite-sized, the carrots and celery on the small side of bite-sized, and then the onions chopped pretty small because I don’t like them in chunks. But you can do it however you like! Combine all the ingredients in a large Dutch oven or other heavy oven-safe dish with a tight-fitting lid. Serve with a loaf of French bread or homemade rolls and some honey butter. 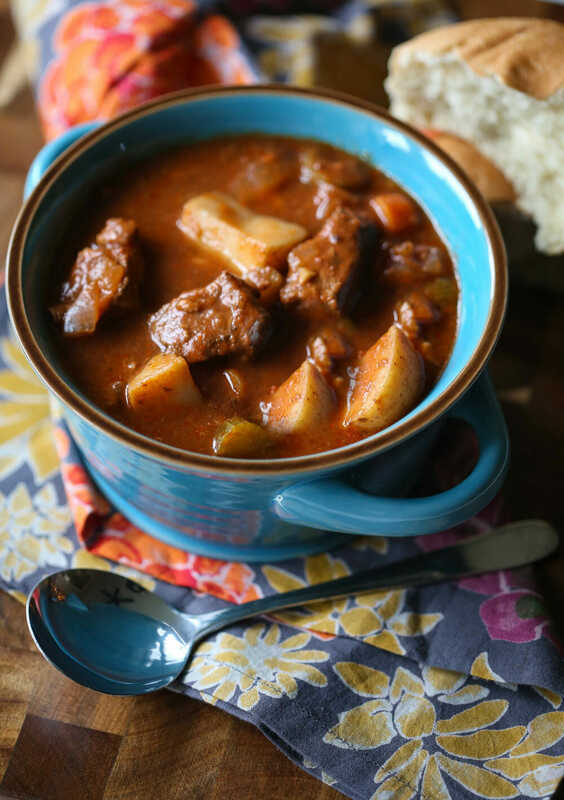 A hearty, comforting, and EASY beef stew recipe perfect for cozy nights inside! Preheat oven to 300 F. Combine all the ingredients in a large Dutch oven or other heavy oven-safe dish with a tight-fitting lid. Cook for 3 hours. I haven’t had great luck making this in the slow cooker or the pressure cooker–the recipe seems to rely on a little evaporation and when I’ve made it using these methods, the stew ends up a little soupy/watery. I’ll keep working on it and see if I can figure it out! Yes! I had the EXACT same reaction to The Boxcar Children. For me, though the books that really awakened me to food were Heidi (I still want to try toasted goat cheese spread on freshly-made bread) and the Little House books. This is basically my stew recipe, down to the V-8, except I throw in a bay leaf. The stew looks fabulous, I love stew, the best comfort food 🙂 I never read Boxcar Children but have definitely herd of it, what a fun memory! That looks just like my Mom's beef stew. Comfort in a bowl. Boxcar Children was one of my favorite childhood books. It's funny that the same scenes stood out in my memories- polishing silverware, building the pool, stew… remember the shelf with all their treasures on it? This recipe just makes me want to go check out the book from the library and read it all in one day while my stew bubbles away in the stove. I really think part of the joy of using recipes from your website is the stories and "piece of your heart" that you both share. Thank you for not only preparing such wonderfully tasty food but also for making cooking a personal and comforting experience. I absolutely loved the Boxcar Children books. They were my favorite! This stew looks delish. I made the kettle corn yesterday and the popcorn was really small fluffs. They didn't get very big. Then the surgar part got a little darker thatn yours. It was yummy and I still ate. Just wandering why my kernals didn't pop very big. Is that normal? That was my FAVORITE book when I was a kid too! I read it over and over. And the stew looks fantastic, if I hadn't made beef stew recently I'd put it on the menu for tonight! Everything I know about The Boxcar Children I learned from a video reenactment my brother did in the 6th grade, lol. Strangely I remember a LOT from that! The stew looks great. I just got 30lbs of potatoes from my husbands Grandma so I think I'll be putting this on my menu for Sunday! Shelly, popcorn kernels are all different. Sometimes mine are big and fluffy and sometimes they are small and dinky. I think it's just the luck of the draw. Also, sometimes the sugar comes out darker and that's just fine. Depends on the heat, the pan, etc. The batch I photographed for that post was unusually light! Make it a few times and you'll get the feel of how it's supposed to look at feel, etc. I love that book. I do have to say, however, that the most memorable part for me was how they put the milk in the rock behind the waterfall so it would stay cold. Simply brilliant. I'm psyched for this stew. Great fall food as we try and transition from Arizona (wonderful) to Chicago (freezing). I had an ancient copy of The Boxcar Children when I was a kid, and I felt the same way about their "playing house!" Another one I loved was Mandy, by Julie Andrews Edwards, where the little heroine finds a tiny English cottage and sets up house. 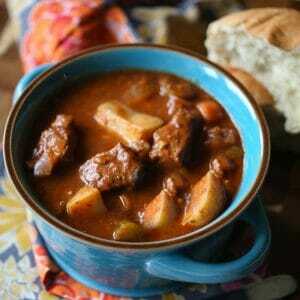 I am always up for a new beef stew recipe, thanks for sharing yours! ved Box Car Children also and the way life seemed so adventurous and simple. I love the memory of reading them aloud with my Dad and brother. I LOVE your site and love that the recipes are all yummy and inspiring! I have yet to meet a recipe of yours that our family didn't LOVE to eat. What a pleasure it is to cook! Funny that I remember similar changes in my house as a kid when my mom died and my dad remarried…pot roast or stew every Sunday after church. Thanks to both of you for all you share with us about food and your life experience. We are huge fans! I loved The Boxcar Children and my children have too! Your stew looks delicious! This would be perfect for a chilly afternoon of football!! Thanks for another winning recipe! Is it just me or it looks like from the picture that there are pearl onions in the stew? I LOVE The Boxcar Children!!! I read it (and all of the rest in the series) over and over again! Cherie–Those are indeed pearl onions! I only had one onion handy and I had a bag of frozen pearl onions, so I used about 1/2 a bag, maybe a little more, in place of the second onions. They were really good, but I think they were a little controversial texture-wise–some people loved them and some people hated biting into a whole onion, so I left them out in the instructions. But you could certainly use a standard bag of frozen pearl onions in place of the two onions. I looooved those books too! Oh I loved the Boxcar Children!!! I read the entire series as a child. It was such an adventure. Hardly anyone else has ever heard of them. I love this site. Thank you so very much. I usually fix at least one of your recipe every weekend. Mmmmmm, I can't wait until it's cold enough to have a nice warm stew! Can I tell you , since I don't usually have time to, how much I love your blog!! ThaNK YOU! This is my first recipe I've tried from your site and I LOVE it! Super yummy…I'm always up for good comfort food. I'm looking forward to trying more of your recipes! We made this for dinner tonight and I thought it was perfect. Our house smelled AMAZING all day! The stew looks GREAT, I'll be making it this week! Do we always have to agree on books? 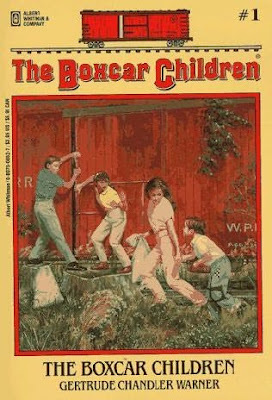 The Boxcar Children were my FAVORITE series growing up. They way surpassed Nancy Drew and The Babysitters Club for me. Thanks for taking me back down memory lane. Don't agree about the food though, sorry but even thinking about stew makes me want to … you get the idea. Adriann, you are officially THE pickiest eater I know! That's okay, though, because I still love you… 🙂 I also am missing you these days–Louisiana just isn't the same without you! Totally one of my favorite books too! My sisters and I spent many, many, many (too many?) hours "being" the Boxcar children. Oh my…such memories! Can you tell me about how many people this will serve? Love your recipes and can't wait to try this one! Jimi, I would say about 8-10 servings. 8 is generous with seconds for average appetites, 10 is probably for smaller eaters. I am making this for dinner tonight–sounds so good! I did have one question though. Do I just throw the two bouillon cubes in the crockpot or do I boil them in a cup of water? Thanks! i am making this tomorrow morning. can't wait. i will let you know how it goes. The Boxcar Children is one of the reasons I am now a chef. Every once in a while, something will remind me of that book. It's wonderful to know it inspired others too! Thanks for the memories. How did I get thru my childhood w/out reading these books?!?!!? I will be buying them for my kids asap! Thx! And the stew looks delicious! I'm making it this week as well! I'm fairly new to your blog but I wanted to let you know that we've tried several of your recipes & have enjoyed them a great deal! Would this fit in my 5-qt slow-cooker? I have trouble with mine sometimes not being as large as some recipes call for, and this looks like a lot of volume. Should I stir it at all? Looks delicious! I LOVED Boxcar Children, I'm pretty sure I owned all of them at one time. Thanks for the trip down memory lane. Makes me wanna go back and read them again. That stew honestly reminds me that time time of my life, my Dad would make beef stew all of the time, I loved it, and I'm pretty certain I'll love this one too. Can't wait to try it. I made this last night along with your honey butter over my whole wheat bread and it was amazing. My husband is a hunter so I try to find recipes that the elk will be good in. And this one is super great. My house smelled so good and I was hoping I would not be disappointed. I wasn't. OHG! Henry, Jessie, Violet, Benny and who could forget Watch, the watch dog they found injured! I LOVED that series. I was in love with Henry and wanted to marry him when I grew up! I liked how they all loved each other! The next time I make stew I will be thinking about The Boxcar Children. Might even make a trip to the library! I know this recipe was posted a while ago, so I hope you get this comment cause I have a question 🙂 Have you ever frozen the leftovers for this? It's just my husband and my two small kids at home, and so I've been thinking I'll either half it or freeze it (if it freezes well). If you could let me know I'd appreciate it!! LOOKS YUMMY! I can't wait for you cookbook to come out. I've already pre-ordered! You don't have to brown the meat first before it goes into the pot? Murray Family–You can totally freeze the leftovers and they come out great. 🙂 I just don't recommend freezing it before you cook it because weird things happen to the potatoes. Thanks for the info!! I’m working on getting my freezer stocked ahead of baby coming, but not many of the meals in your freezer article are ones my family will eat…I love the advice bit about only putting up food that will actually get eaten! I loved The Boxcar Children too! I made this stew tonight and it was FABULOUS!! I LOVED it. I have tried A LOT of different recipes for stew and don't ever really love any of them. I love the concept of stew it's so hearty and healthy, especially on cold days like today. To be totally honest I wasn't really expecting to care for it much, I just thought I didn't like stew, but this was o so good! I am already thinking of the next time I can make it! Serioulsy both my husband and I went back for seconds and my two small boys ate all theirs up! Thank you so much! I love your site and all your recipes. You are both amazing! I shared the recipe on my facebook page using your link 🙂 I had to tell everyone how good this stew is! I baked our leftover stew into individual serving pot pies. I had to drain off a little of the broth, but they were so moist and delicious! I almost liked it better as a pot pie than the stew by itself. Made it with the homemade crust too. I have one question, Do you need to brown the beef first? just finished putting everything in the crock pot for dinner tonight…in your opinion which is best? Crockpot or oven?? Sorry I’m just getting back to you!! Do you have tomato juice? Or Bloody Mary mix? Wow did this take me back- I loved the boxcar children, especially the cooking part! I was so excited about the idea that children could cook that my mom bought me the Boxcar Children Cookbook- it was my first cookbook and is still on my kitchen shelf! Can’t wait to try this recipe- I bought all the ingredients tonight, so hopefully tomorrow! Best beef stew EVER!!! I will be making this again! it was a hit 0 infact I had 2 crockpots going at the same time….. added some drop bisquits with your honey butter and some fresh fruit and we had an awesome meal – Thanks so much! I made it tonight. My super picky son ate the meat out of it and loved it. Thanks. Now, what to try next? Another huge hit! Wow, I cannot get over how good the sauce of this is! I had given up making beef stew years ago as I could never get the sauce to be just right. I made this yesterday and am eating it again for lunch today! I made some adjustments to the veggies(no onion or celery, added mushrooms) to suit our families tastes, but kept the rest of it exactly as written. So fabulous. The Boxcar children was my favorite too. Thanks for the memory. Am making this stew today, but will add parsnips as they need to be used up. Dont have any V-8 but with so many tomatoes here from the garden I think I should try and make my own. Anybody ever done that one ? This is almost the exact recipe my Mom used to make. Hers was called After Church Stew (I think because she could put it together before church, pop it in the oven, and it would be ready for Sunday dinner.) She served it on Sunday so often that our Pastor would tease her that he thought it may be the only thing she knew how to cook but that was okay by him! (Apparently he ate with us quite often on Sunday afternoons!) 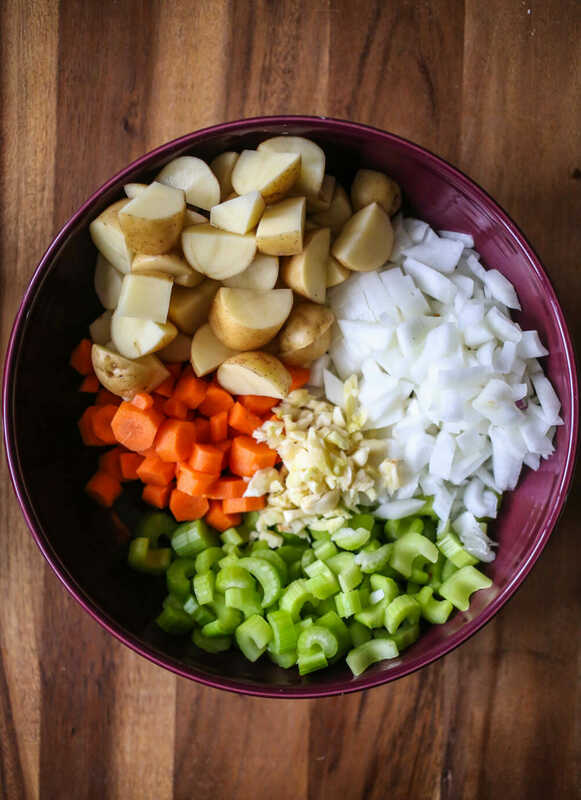 Still my favorite stew recipe to this day – I’m definitely going to try the few little changes given in this recipe! Oh I love to read and love when other people mention books. 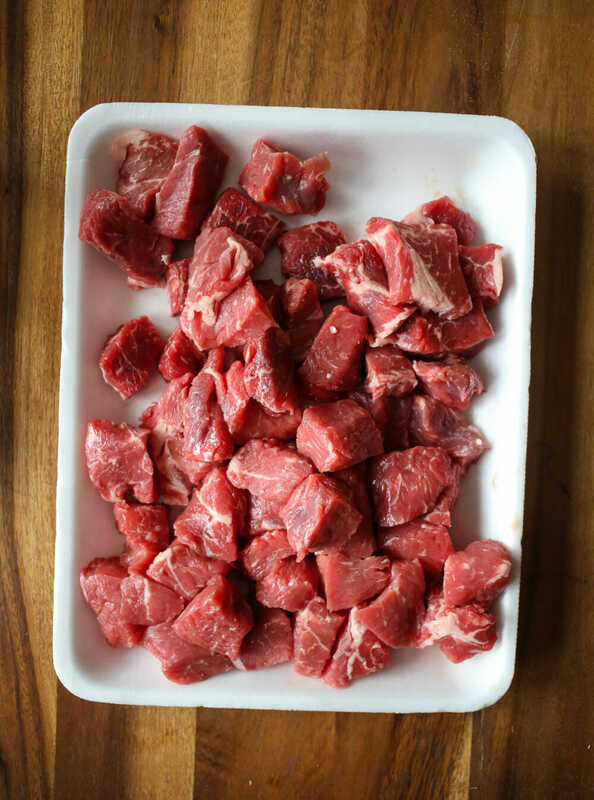 I love beef stew but have always had a hard time finding a good recipe or one that does not require a 100 steps and ingredients, so this I’m excited to try but there is one little problem and this is my question. Do you think I could use a pork roast instead? Due to dietary issues my husband and I do it for support have not had beef since the middle of the year. Well Ok I cheated a few times, mostly for a greasy taco and a steak or two. You could always try! 🙂 I’ve never used it, and the flavor profile is a bit different, but you could always give it a shot! Is it possible to substitute something if I don’t have fresh garlic on hand? Garlic powder or something else? I would say about 8-10.
this looks so yummy! i would love to make this on sundays, to have right after church. but i worry about leaving my oven on, when im not home. so…. my question is…. can i cook this at alower temp, for a little longer time.? Made this tonight in the crock pot. Everyone loved it! Will definitely be making it again this fall/winter! Thanks!! My children (ages 8 & 10) & I just put this together & it is cooking now. My daughter loved the book when they read it in class in second grade so she enjoyed the refenrence. It’s 33 degrees for the high today so it’s a perfect night for this meal. Thank you for the pictures with the recipies, it makes more interesting for my young chefs. I read that book so so many times when I was in 2nd grade! I loved all of them, but I definitely read the first one over 30 times 🙂 The entire idea was so intriguing. I loved this recipe. I can’t use the soup because of gluten issues in our family so I coated the beef with gluten free flour and added the V8 juice along with the beef base and beef broth to cover. It turned out great!! I made this yesterday for the first time in the crockpot. I always make it in the oven, and it turns out great, but I don’t recommend in the crockpot. The meat was…it was hard to chew, and then all of a sudden would disintegrate while chewing. The veggies were okay, but the “broth” was not any good. Plus it didn’t cook in the right amount of time. I started it on high for an hour, then cooked it on low for 6, checked it, and cranked it on high because I could tell it wasn’t going to be done in two more hours…as it is, after two more hours on high, I just pulled the crock out of the cooker and stuck it in the oven, uncovered for a half hour. Definitely will just stick to the oven on this one!! What a wonderful recipe! My husband said it was the best beef stew he had ever had! I made this before and liked it. I just added it to my “having a baby frozen meal” list. It does in fact fit in a gallon sized freezer bag 😀 Haven’t made it yet but I suspect it’ll be fine. Made this recipe yesterday in the crockpot. Cooked on high for 6 hours and it came out delicious! Thanks for a great beef stew recipe! Hey Mark! Well of course I’ll see YOUR comment 🙂 LOL – thanks for the heads up! We recently had all our recipe cards auto-update to a new format and we’re finding little glitches like this. Thanks for helping us catch it! 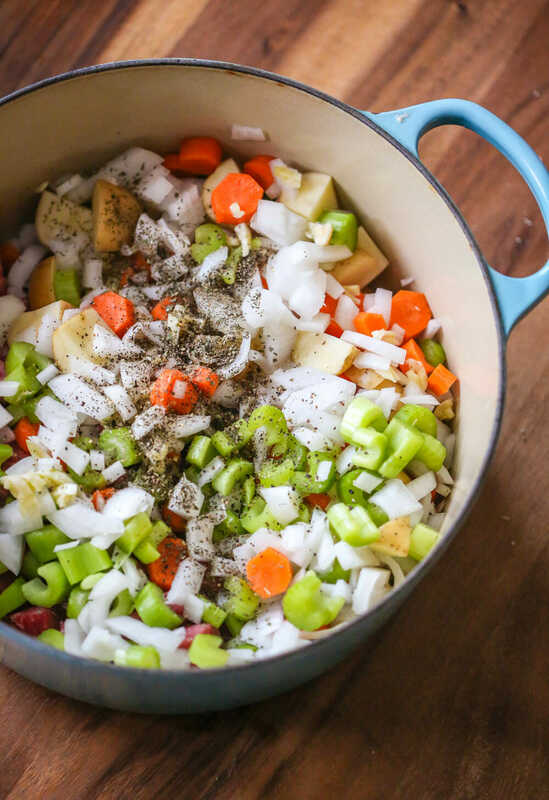 We love this stew at my house! Could I increase the oven temperature to 350 and cook it more like two hours to save a little time?